Main Attractions: Nature center, nice trail system, ponds, bogs, woodlands, open fields, abundant wildlife. Sharon Audubon in Sharon, CT. might be the best place in western Connecticut to see wildlife in all its forms. The center has done a great job of creating an educational center that is immersed in a variety of ecosystems. The trails are laid out in a manner that allow a hiker to easily experience different ecosystems. There are a variety of paths to choose from and all them will take you through some interesting terrain. At the parking lot near the center's main building you'll find a map and information board and a list of recent wildlife sightings. Sharon Audubon Center offers quiet forests, open fields, ponds, bogs, and other natural spots that will keep all hikers interested. As you make you're way through the center's trail systems, you'll have a great chance of seeing many different types of birds, raptors, mammals, insects and aquatic life. Hawks, owls, sparrows, finches, hummingbirds, butterflies, bats, frogs, toads, fish, deer, beavers, coyotes, and foxes can be in one outing if you're lucky. The wildlife has a great ecosystem in which to thrive in. 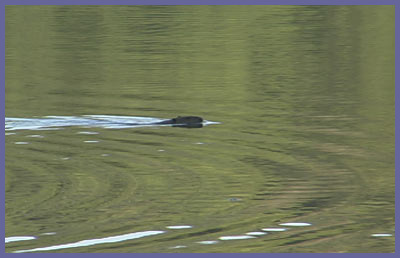 Woodlands with a variety of trees, open fields with wildflowers, and two large ponds teeming with life above and below their waterlines, all guarantee that the animals at Sharon Audubon enjoy a robust existence. 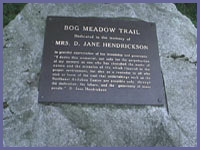 As you hike along the trails you'll notice information "tubes". These clear plastic cylinders are dotted throughout the center and provide interesting facts about the natural surroundings. There are also a few plaques along the way dedicated to people who's commitment to nature ensures that places like Sharon Audubon Center remain protected and thrive in the years to come. If you're into photography or painting, you should make Sharon Audubon a destination. There are endless opportunities for you to create your artwork. Sharon Audubon Center is a place where families, solo hikers, or groups can enjoy a wide range of ecosystems and scenery all within a relatively small area. It's always surprising to experience places like Sharon Audubon. Within a short amount of time you can find yourself in a world completely different from your everyday experience. There are endless treasures to find no matter the time of year. The trails are mostly flat and not difficult to hike around on. If you can go at dusk or dawn you'll have a greater chance of seeing lots of wildlife. But it really doesn't matter because the center is teeming with life and you'll be sure to catch a glimpse of some amazing creatures. Directions: 325 Cornwall Bridge Road. Sharon, CT 06069 Phone: 860-364-0520. At the intersection of Routes 4 and 7 in Cornwall, CT just north of the town of Kent, take Route 4 east as it heads up a steep hill (a gas station will be on your left at the base of this hill as you proceed upwards). Proceed 7.3 miles on Route 4 to the entrance to Sharon Audubon which is clearly marked with a large wooden sign. Head into the center and park in the dirt lot just to the left of the buildings where the map and information board is located.